Less than 35 miles from where I sit is North Carolina, a state that once prided itself of being a state that was business minded and avoided issues that upset the larger business community. Then, the North Carolina GOP won control of the state legislature and the governor's mansion and insanity set in. Or more precisely, the North Carolina GOP decided to utterly prostitute itself to the Christofascists, in particular by enacting HB2 that not only attacked restroom use by transgender individuals bit also rolled back many civil rights protections. The irony is that the whole effort which was supposed to have guaranteed Republicans being re-elected this November has blown up in their faces. Indeed, Gov. Pat McCrory, a incredibly craven individual may lose re-election because of the social and business fallout from HB2. Now, the Charlotte Observer has endorsed Roy Cooper, McCrory's Democrat opponent despite its decades long history of supporting McCrory in the past. The Charlotte Observer’s editorial board has endorsed Republican Pat McCrory in every one of his bids for office since 1991. That includes twice for City Council, seven times for mayor and twice for governor. That streak comes to an end today. McCrory’s term as North Carolina governor is the ultimate illustration of the Peter Principle: that people are promoted based on their past performance and not the abilities needed for the new role and thus rise to the level of their incompetence. McCrory has certainly done that. Fortunately, voters have a superior option in Democrat Roy Cooper. 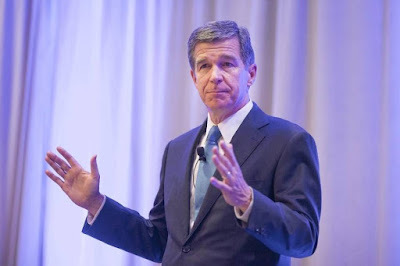 A Morehead Scholar at UNC, a former Senate majority leader and a four-term attorney general, Cooper has the experience, the intelligence and the policy stances needed to return the state to its stature as a progressive leader in the South. That stature has been lost under McCrory. While the state’s and nation’s attention has rightfully been focused on HB2 since spring, McCrory’s lack of leadership and wrong-headed policies have been on display since his first year in Raleigh. McCrory rushed to sign House Bill 2 on March 23, hours after the House and Senate rammed it through. North Carolina’s reputation has been melting ever since. McCrory adamantly defends the discriminatory measure and dismisses the NCAA, the ACC, scores of business executives and others who have condemned the legislation. It was a hateful and self-defeating bill, and it will be McCrory’s legacy. Cooper opposes HB2 and says he would work to repeal it. McCrory has signed enough bad legislation to fill a library, and his administration has enacted one misguided policy after another. He supported new restrictions on abortion after promising he wouldn’t. He signed what many experts have called the nation’s most restrictive voting laws. He has been soft on his former employer, Duke Energy, after a catastrophic coal ash spill. He has been tepid in raising teacher pay, while cutting teacher assistants and other education spending. He refused to accept billions of dollars from the federal government to provide health insurance to the poor. Under McCrory, North Carolina was the only state to cut off long-term federal unemployment benefits, the first in the Southeast and maybe the nation to decline federal money to study streams and wetlands and the only one to cut WIC benefits during the federal government shutdown. Cooper supports the other side of every one of these issues. 3. We need a check on the legislature.McCrory has been spineless before Senate leader Phil Berger and House Speakers Thom Tillis and Tim Moore. Cooper would offer more resistance and, if Democrats pick up a handful of House seats, would use his veto to stop the legislature’s most egregious ideas. 4. Cooper’s integrity, education and experience.McCrory had no state government experience and it has shown. Cooper was a leader in the legislature and then served 16 years as attorney general. He knows the state and its history, and understands its government from different perspectives. He would not have the learning curve McCrory continues to climb. Cooper has a clear vision of what he wants to accomplish, built largely on investing in public education and creating a well-trained workforce that will feed a growing economy and strengthen the middle class. Applying the Observer's criteria here in Virginia, it basically comes down to a condemnation of failed GOP policies that have supported religious extremists, trampled on civil rights, and been bad for working Virginians. Thankfully, we have had a Democrat governor who could veto the worse of the batshitery.